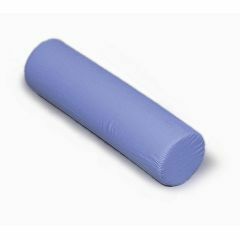 Customers buy this product with the Mabis DMI DMI Elevating Leg Rest Cushion Pillow - 28" x 10" x 7"
The Foam Cervical Rolls is easy and effective way to help provide pain relief for both cervical and sacral discomfort. Constructed of highly resilient polyurethane foam. Use for neck, back or under knees. Includes removable, zippered, machine washable, blue polyester/cotton cover. Rolls come in three sizes. Easy to Control. Comfortable. Solid Construction. Attractive Design. Multiple Positions. The only thing I have fou. Comfortable. Multiple Positions. Solid Construction. Long Term User. Short Term User. Medical Professional. not great it flattens out after use , I would reccomend a larger diameter also. by art ladie from Ct. Comfortable. Easy to Control. Solid Construction. The cervical roll is a great asset to your current pillow. Attractive Design. Multiple Positions. Solid Construction. When u list the dimensions for the different sizes, is the 1st # (3 1/2", 5" & 7") the circumferences or the height of the pillow?